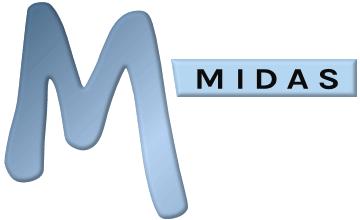 MIDAS gives you extensive control over the fields that appear on the booking screen, public request/public booking screens, search results, print outs, and email booking confirmation notifications. By default, 8 booking fields are present: Date(s), Times, Venue(s), Attendees, Client, Type, Notes, and Resources. With the exception of the Date(s) and Venue(s) fields, each field can be shown/hidden, and on the booking and request screens also set to be optional or required. You'll find these settings via MIDAS Admin Options → Manage MIDAS → Fields. Click/tap the icon alongside the field you wish to edit. Click/tap "Ok" when done to update your custom booking field. Click the icon alongside the field you wish to delete. You can change the order in which fields are shown, via the "Re-order Fields" button.